TERRA HAUTE, IN—In a surprising turnaround in US policy, Attorney General Jeff Sessions unveiled a new social program Wednesday at a press conference set up in front of a federal institution. The new government funded program will provide universal housing and food for all African Americans at federal facilities. When asked how the project would be funded, Sessions insisted that the program would pay for itself, though he did not include any economic details in his prepared remarks. “This project is completely shovel-ready,” Sessions insisted, while pointing to a long line of shovels and pickaxes laid out along the length of the nearby road and ready for use. 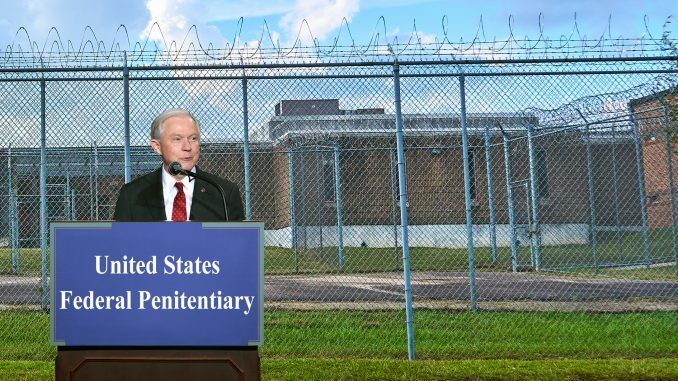 While the apartments would typically be small at 6 x 8 feet, Sessions noted that they would each include a master half-bath amenity and that residents would feel secure within their gated communities. While most apartments are designed for double or triple occupancy, opportunities for more solitary accommodations would also be available, Sessions added.